When I was a young girl, and living in Mendoza, Argentina, I would spend a significant amount of my free time at my grandparents’ house. Her home was located in Guaymallén, on a small dirt road that sat parallel to the main interstate running north and south through the whole province. Every Saturday morning a little bolivian woman would push her wheel barrel down the street. “Verduraaas! Frutas fresquitaaas!” she would notify everyone in the area that she was present, with fresh fruits and vegetables in tow. “La verdulera” we used to call her, or “the veggie lady”. “Llegó la verdulera!” I would holler to my grandma, letting her know that “the veggie lady is here!”. I remember she would grab some plastic bags from under the sink, bundle up, and head to the street. I would hurry into the kitchen and put some water to boil, stick a baggy of hierba mate (common herbal tea) in a mug, and bundle up to go outside. It was not out of the goodness of my heart that I thought of making the verdulera a cup of hierba mate. It was just what my Grandma would always do, so really my “kindness” was more of a custom, a habit. Once I was outside on the street, a few people had trickled out of their homes to skim that week’s collection of produce. I would hand la verdulera the cup of tea, which she would always accept with a smile and a “Que Dios la bendiga”, or “May God bless you”. At the time, I always thought that was a rather strange response for such a simple, automatic gesture. But I would smile back and go talk to her two little boys who sat in a little compartment at the back of the cart, and whose only body part you could see where their small black eyes peaking through layers and layers of blankets.I would hold the plastic bags open for my grandma to plop fresh fruits and vegetables into, and then I remember something else. When we were done shopping, my grandma would pay the verdulera, and then she would very discretely pull a fresh orange, apple, or other fruit out of her bags, and give one to each of the little boys. She’d pat them on the head, and we’d go back inside. Now, we all retain memories. Some of them are important to us for one reason or another, and others make us go “why on earth do I remember THAT?”. Well up until a few years ago, this one particular memory was one of the latter types of memories. There was nothing really fascinating about my grandma buying produce from a street vendor, and there definitely wasn’t anything fascinating about holding bags for my grandma. I think my God-given brain was nice to me, and said “I think I’ll let her keep this one, so she can remember why her grandma is one of her main role models in life”. I really think my brain said that to itself. And then it told my heart “I’ve done my part, man. Seriously, soften up already”. So my heart sighed and said “ok, I’ll let her embrace the warm and fuzzies of remembering one’s role model do something good without being seen or flaunting.” And since my brain and heart worked it out, I feel warm and fuzzy every time I remember my grandma and la verdulera. My grandma didn’t have a lot of luxuries in life. She was a hard worker, she worked hard for what she had. You could see her strength and years of labor in her hands, around her eyes, and in her crooked back. She would crouch over that sewing machine and mend dress pants, skirts, anything you can imagine. And then, she would put her job to a side, and sew me a dress for my school play. She would stop sewing, and spend hours upon hours making noquis, ravioli, pastelitos, and all sorts of pasta for her very large family to feast on together at a very long table. She would remove the sweets that my diabetic grandpa would hide around the house, and eat them herself “because I’m not diabetic”. She would take me for a bus ride, and then for ice cream just like she used to do with my mom. 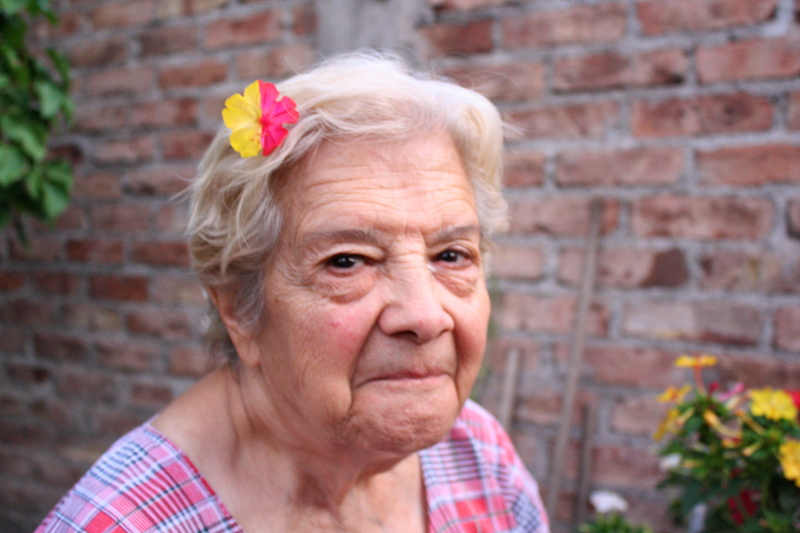 She would spend hours just talking to me while she sat at her sewing machine, giving me words of wisdom about how fundamental a good education is in life – reminding me that “vos no sos mejor que nadie, y nadie es mejor que vos”. “You are not better than anyone, and no one is better than you”. She taught me so many lessons, some verbally, and others just by living by example, a woman full of humility and strength at the same time. She never told me why she made la verdulera a cup of hierba mate every Saturday morning, and she never told me why she would buy two extra fruits to give back to la verdulera’s kids.I think she knew that I would figure it out on my own, because she had confidence in me. I think she knew God gave me a brain and a heart that would work things out for me. I don’t know what possessed me to write in such length about something that seems so small in the grand scheme of things, but I’ve learned there is no use in trying to keep things inside. I always need to let it out somehow and at some point, and right now I’m home alone and Daniel’s busy at work, and my laptop’s right here. So there you go. Usually I post some kind of deep, wordy introductory entry. But I’m psyched about this new phase of blogging, and this time it’s different. This is me jumping in because I’ve been planning this entry for over a week now. 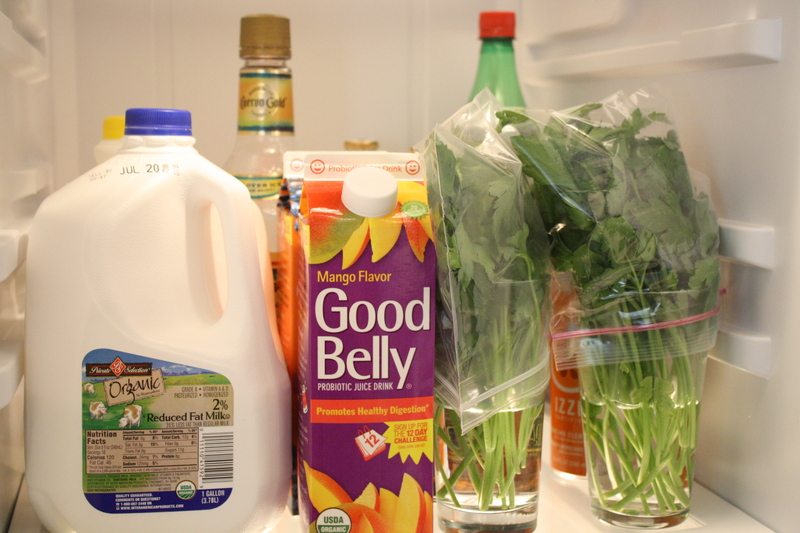 And I’m super excited to share my first attempt at keeping fresh (organic) parsley fresh! I specify that this particular bushel of parsley is organic because, if you buy organic, you know that the rotting process happens a LOT quicker with organic produce than, well, the modified kind. So the idea of conserving organic produce for more than a few days seemed like a good one to me. I was tired of wasting herbs, and leafy veggies so I binged “how to keep parsley fresh”, clicked on one of many ideas, and gave it a try. It worked! 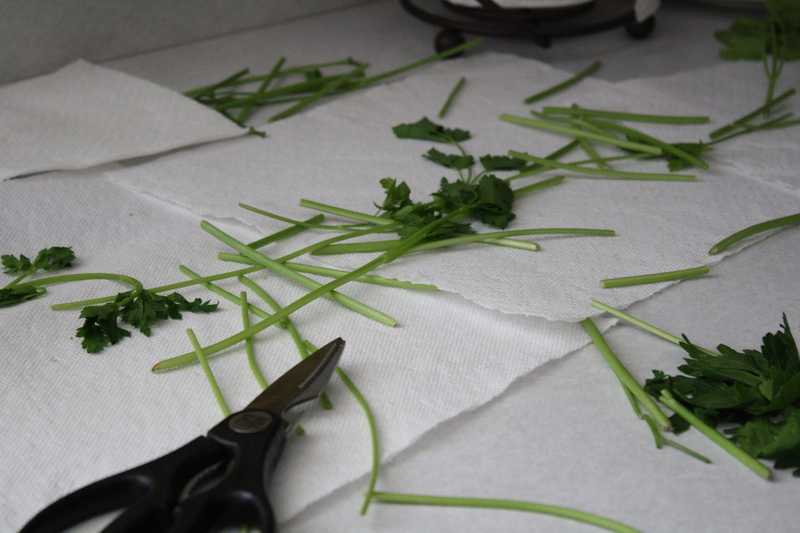 First, I washed the parsley, then I cut off excess stems and puny leaves. Then, I placed the parsley stems in about 8 cm deep of water, and covered the leaves loosely with a sandwich size ziploc bag. A week later, the parsley was still super fresh! I’d been warned that I’d have to change the water because it would turn green, but the water was perfectly clear. 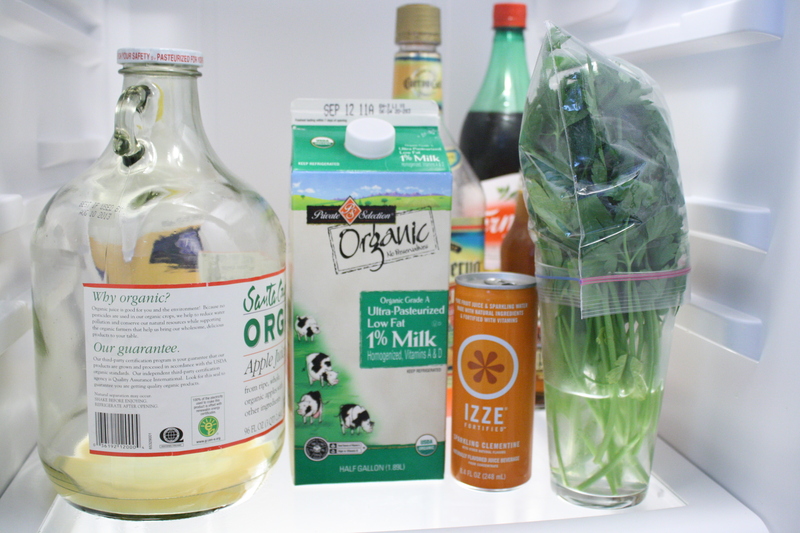 AND it made the inside of the refrigerator so pleasant to look at. So I guess that the first thing you can find out about me from this blog, is that I’m trying to learn my way around the kitchen, and ways to prevent wasting perfectly good, wholesome foods. You also learned that I’m a metric gal. Meters all the way, baby. One of my main objectives for this blog is to … socialize more (if you will) and communicate with other people who are interested in and excited to learn and share new things. So let me know what you think, and please give me any other cool kitchen-related advice that you might have up your apron pocket :).